NEW LOWER PRICE! MUST SEE! 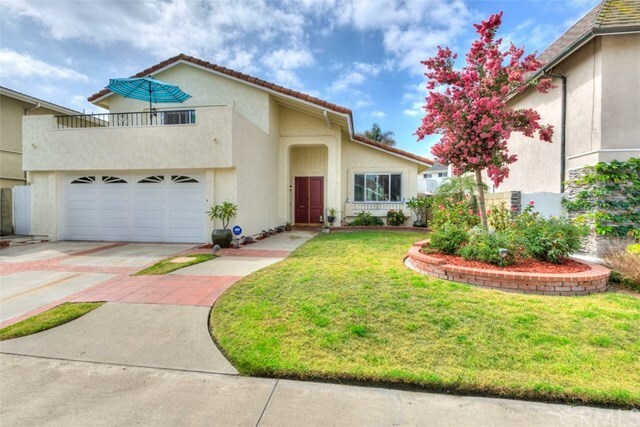 Beautifully updated College Park East Cornell model in the highly desirable Los Alamitos School District! Welcome to this spectacular 4 bedroom 3 bath home, which includes one bedroom and a three-quarter bath downstairs. The spacious kitchen includes new granite counter tops, dual ovens, track lighting, and white cabinets with upgraded hardware. Enjoy the backyard view through the all new Milgard dual pane windows which were recently installed throughout the entire home. New copper plumbing has also been installed throughout the entire home. Cozy up in the overly spacious den complete with wood burning fireplace. All of the downstairs flooring, stairs and landing have been replaced with rich laminate wood flooring while the 4 bedrooms have newly installed carpeting. The second level boasts 3 large bedrooms all with walk in closets. The spacious master suite includes a three-quarter bath and 2 closets including a walk-in closet. Enjoy your morning coffee from the private balcony which overlooks Heather Park, then relax in the evening with a glass of wine while enjoying the Disneyland fireworks. This home also features a large formal living room and dining room for all of your entertaining needs.